I was excited to get this book for my 7-year-old daughter. The day it came in the mail, she read it to me as soon as it was opened. It's a beautiful book. 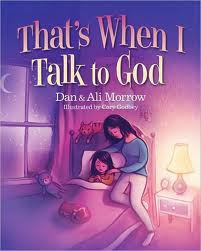 That's When I Talk To God by Dan & Ali Morrow is a wonderfully written story of a little girl who is learning that she can talk to God anytime, anywhere, and about anything. Exactly what I've been teaching my daughter. The little girl's mom in the story asks her the question "You know we can pray to God anytime we want to, right?" Then the little girl sees things in her everyday life that she can pray about. It helped my daughter to understand that she can pray anytime as well. This book is beautifully illustrated by Cory Godbey. The cover itself is inviting for any child and the pages are bright and colorful. I'm a parent and I love it! It's exactly the kind of book I look for when buying for my kids. A great lesson wrapped in a story with beautiful artwork. It's a keeper! *I received this book for free from The B&B Media Group for my honest review.